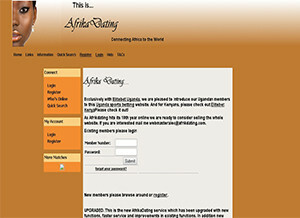 Description: Afrika Dating has had a makeover and is now back following a relaunch with many more functions and information for the South African single looking at online dating to meet single men or single girls. The website is very clear in its delivery and purpose but unfortunately is dependent on advertising to keep it running and this is evident from the many advertising and pop up options around the web pages. The Colour scheme and graphics imply a website geared towards South African born people of colour and closer examination of information details the focus on ladies getting husbands from all over the world. The site allows simple registration, search facilities and information that can be browsed including photos as well as the usual characteristic of personality. Unfortunately the website struggles with some of the technology being applied and I have found the pages freezing on me and stopping me searching properly or being able to complete registration. The website is free to join and perhaps this is one of its major advantages. There are no indications of the number of profiles on the site and no indications of successfully finding boyfriends and girlfriends for anyone. Given the difficulties with the technology it is not surprising that the help and information sections will not load up easily and for many people who do mange to join this site they may be a little disappointed by the narrowness of variety of the available singles online. The website has multiple advertising banners and many people will no doubt be distracted sufficiently by these to try and utilise these links as options to go off and join other dating sites. An initially good looking website, that is free to join but had limited working functionality and limited range of available of lonely hearts or online personals. Ease of use: The design is very good and imagery is excellent but navigation and corrupt scripts cause the website to fail on several pages and this causes frustration for potential users. The online dating market has many more superior quality websites and this would not be my first choice website for online dating in South Africa. Selection of profiles: No information can be gained on the selection of profiles and the numbers. A basic browse appears to show a restricted portfolio of native born ladies of colour interspersed with a few men. The website does not display how profiles or give this information anywhere. Star rating: 1.5/5. Nicely designed but very poorly constructed website, multiple webpage failures, lack of information and inability to open terms and conditions does not give confidence to the user that it would be able to reliably gain many potential long term partners for South African singles. It has one benefit – that it is free to join and unfortunately the number of advertisements give the user many other links to follow for more reliable online dating websites. No information provided on the website and the corrupt scripts a lot of web pages being opened.